Mary Catchur and Marimark Mortgage were featured in a MortgageLoan.com article about reverse mortgages published April 5, 2016: Using a reverse mortgage to pay off your home loan. Several quotes from Mary appeared in the article about the basics of a reverse mortgage. She explains common misconceptions about reverse mortgages, how reverse mortgages can help people strapped for cash, how a reverse mortgage can be used to pay off an existing mortgage, and how reverse mortgages can help the elderly people pay for costly medications and upkeep of their home. 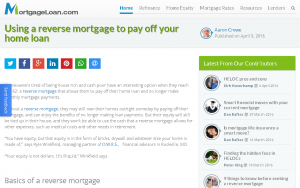 To read the article, visit: Using a reverse mortgage to pay off your home loan.